The UH Mānoa at Kakaʻako campus is invested in the health and well-being of its students, staff, faculty, and visitors. To that end, we are in the process of complying with University of Hawaiʻi Executive Policy EP 10.102 ("Tobacco Products"), in order to move toward a smoke-free campus. In addition, we continues to adhere to Hawaiʻi State law, which prohibits smoking within a reasonable minimum distance of 20 feet from public buildings. 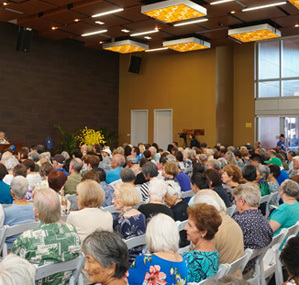 It is the mission of both the John A. Burns School of Medicine and the University of Hawaiʻi Cancer Center at Kakaʻako to discourage unhealthy behaviors such as smoking, to treat diseases associated with smoking and second-hand smoke, and to investigate ways to improve the treatment of or cure smoking-related illness. We are grateful to the people and leaders of the State of Hawaiʻi who committed public monies to build the school and center, investing in better health for Hawaiʻi. The construction of the medical school (JABSOM) was financed with Master Settlement Agreement Funds set aside for that purpose by the Hawaiʻi State Legislature. The MD graduates treat patients who suffer smoking-related disease, while the public health graduates work to educate the public about the dangers of smoking. In addition, with the support of the Hawaiʻi State Legislature, the Governor and the people of Hawaiʻi, a portion of taxes placed on cigarette purchases helped fund the construction of the UH Cancer Center's facility in Kakaʻako. Researchers study smoking behaviors among Hawaiʻi youth and look for ways to prevent and reduce unhealthy habits that can lead to cancer. Smoking is not allowed in any interior spaces of JABSOM or the Cancer Center, nor within 20 feet of building entrances, exits, air intake ducts, vents, and windows of buildings that are not air-conditioned. We ask all those who visit or work here to join us in expressing the spirit of Aloha: being thoughtful and considerate of one another here in our University community.